More secure, easy access to patient information and the ability to communicate with the right person at the right time is central to this model of healthcare delivery. We are at the same turning point with enterprise collaboration experiences. We move between multiple modalities: casual messaging, real-time, messaging, ad hoc meetings, formal meetings, and so on all of which make up your workstream. Bouncing between them does not foster productivity or innovation. The solution is not better screens, faster meetings, or better voice quality. The best experience is one that seamlessly connects your workstream. Bottom-line: seamless, integrated solutions drive better outcomes. Samuel Kwok is the Business Development Manager of Cisco Collaboration Team responsible for Hong Kong & Macau collaboration business. He possessed great sales & distribution management experience and is a consistent performer who met sales targets in last ten years. With strong relationship with senior executives of key IT vendors and government officials, Samuel accomplished excellent sales track records. He is also familiar with Great China market environment and build a strong channel partners ecosystem. His knowledge covers a wide range of industries including Product distribution, Consumer market, Healthcare, Manufactory, IT related industries. Samuel is also the team lead for Collaboration Architecture Plays in building new partner landscape all over Greater China and coordinated partners enablement scheme for more 100# collaboration partners. Healthcare has faced MASSIVE changes over the past 5 years? with many disruptive technologies. Everything from electronic health records, new patient portals, IoT-enabled medical devices, cloud services, and more. Plus they still face the challenges of securing multiple branch locations, protecting guest wifi, and visiting staff, who bring unmanaged mobile devices onto the network. Healthcare has become a lucrative target for criminals because medical records are worth 10 times that of credit cards. We talked a few weeks ago about ransomware becoming a bigger problem, and for hospitals, it is not only an expensive annoyance, but it can also delay care for patients or potentially worse. 1. What is Healthcare Specific Security Challenges? 2. Are your organization Ready for Cyber Security? 3. How to protect your organization from Ransomware? Leslie has over 20 years of experience on networking, wireless and security solutions. Leslie holds Bachelor of Electrical Engineering, Master of Information Technology and advanced diploma in Health Informatics. Leslie is a Professional Engineer in Canada and he is CCIE, CISM, CISA, CISSP and CEH certified. In this session Cisco experts talk about the next generation of data centre architecture, and how it is transforming business. 1. Understand how you can on-board new applications and scale existing applications while protecting our existing investments in the data centre. 2. Gain insight into how your IT organization can automate up to 80% of tasks performed by IT admins - using a policy driven model across network, storage and compute platforms. 3. Understand how you can dynamically choose any data centre, public or private cloud to run your applications on. Eddie Leung is the Product Sales Specialist, Data Center Virtualization (DCV), Greater China. He is responsible for orchestrating DCV business (composing of Compute, Network, and Storage Networking) in Hong Kong and Macau. He has a long and proven history of sales & channel and business development consistently delivering values to the Greater China team. With strong business senses and execution, he managed to double UCS growth in 2 years and consistently maintaining double digital growth on overall DCV business each year. His profound knowledge in various Data Centre solutions like VDI, Big Data, SAP HANA, SDN, Hybrid Cloud Deployment and Orchestration and Data Centre Analytics makes him a popular presenter in many customer and partner enablement occasions. Deadline for registration is 18 April 2017. 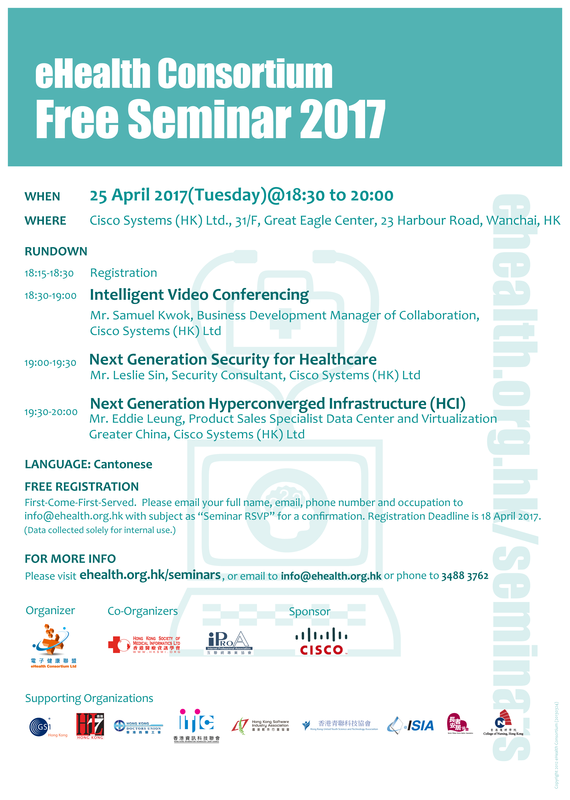 Please email your full name, email, phone number,occupation and company name to info@ehealth.org.hk with email subject as 25 April Seminar for a confirmation. (Updated on 28 March 2017) Stay tuned for information on our next seminar!